The Apple iPad, iPod Touch and iPhone are all good for accessing media such as live TV, radio or Video On Demand (VOD). These can be viewed directly on the device, or on a larger screen. There are also a number of ways to connect the Apple devices to your TV. You can in many cases use the browser to go directly to various TV and radio sites, a much easier option is to download the various apps available for the iPad and another iOS device like the iPod Touch and the iPhone. Some apps only require a Wi-Fi connection, others will only be available only in the UK, these will require a UK Virtual Private Network (VPN) when used overseas. Apps available for iOS include BBC iPlayer, ITV Player, 4oD, Demand 5, Sky Go, TVCatchup and TuneIn Radio. Visit the app store to see what other apps are available. 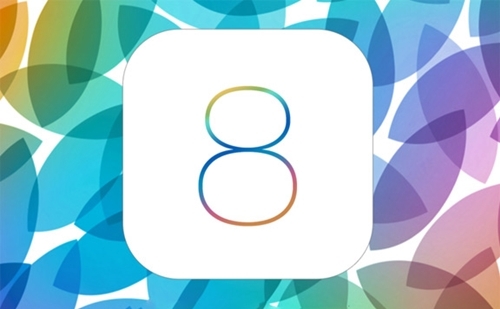 iOS 8 is the eighth major release of the iOS mobile operating system designed by Apple Inc. as the successor to iOS 7. It was announced at the company’s Worldwide Developers Conference (WWDC) 2014 on June 2, 2014, and was released on September 17, 2014. iOS 8 supports the iPhone 4S onwards, and iPod Touch (5th generation), iPad 2 onwards, iPad Air and the iPad Mini. Use the Apple Digital AV Adapter to mirror whatever is on your iPad or iPhone 4S screen — apps, presentations, websites, and more — on your HDTV or HDMI-compatible display in up to 1080p HD (movies play at up to 720p). Watch slideshows and movies on the big screen in up to 720p by connecting your iPad, iPhone 4, 4S, 5, or iPod touch (4th generation) to an HDTV or HDMI-compatible display. The Apple Digital AV Adapter routes digital audio to screens that support it. 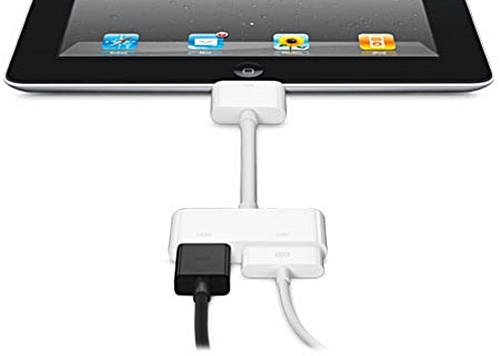 Connect the Apple Digital AV Adapter to your iPad, iPhone, or iPod touch (4th generation) via the 30-pin dock connector and to your HDMI-compatible display using an HDMI cable. 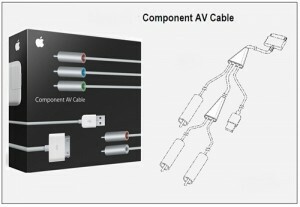 This cable does not mirror, though it will route video-enabled apps, photos, and music to your TV. It is compatible with all iPhones, all iPod Touches, iPads, the iPod Nano (3rd generation and later), and the iPod Classic. 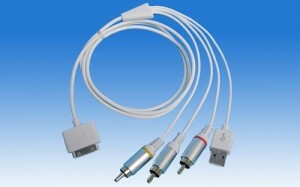 Games, such as Rage HD (for the iPhone 4 and up), have been optimised to work with this cable. The iPhone becomes the controller, and gameplay is displayed on your TV. This is not the ideal solution to watch live or on-demand service. Connect an iPod, iPhone or iPad to your television with the Apple Composite AV Cable, you can also connect the Composite AV Cable to your stereo or powered speakers. This cable is for older iPads and iPhones and cannot be used for devices using a Lightning connection, using an Apple TV would give a better quality picture. The Composite AV Cable connects to your device or Universal Dock via the 30-pin dock connector and to your TV, home cinema receiver or stereo receiver via the composite video and red/white analogue audio ports. The cable also features a USB connector that you can plug into a power source. Use the Lightning Digital AV Adaptor with your iPad with Retina display, iPad mini, iPhone 5 and iPod touch (5th generation) with Lightning connector. The Lightning Digital AV Adaptor supports mirroring of what is displayed on your device screen — including apps, presentations, websites, slideshows and more — to your HDMI-equipped TV, display, projector or other compatible display in up to 1080p HD. It also outputs video content — films, TV programmes, captured video — to your big screen in up to 1080p HD. Simply attach the Lightning Digital AV Adaptor to the Lightning connector on your device and then to your TV or projector via an HDMI cable. With an Apple TV, you can use the AirPlay feature and avoid cables altogether. Connect your iOS device to the same Wi-Fi network as your Apple TV, select the video you want to watch from your device, and press the AirPlay button (this is hidden when you are not on the network). Select “Apple TV,” and your content will begin streaming. Use AirPlay to stream photos, videos, live content, or music to your TV. The Wi-Fi connection on Apple TV is 802.11a/b/g/n. H.264 video up to 1080p, 30 frames per second, High or Main Profile level 4.0 or lower, Baseline profile level 3.0 or lower with AAC-LC audio up to 160 Kbps per channel, 48kHz, stereo audio in .m4v, .mp4, and .mov file formats. MPEG-4 video up to 2.5 Mbps, 640 by 480 pixels, 30 frames per second, Simple Profile with AAC-LC audio up to 160 Kbps, 48kHz, stereo audio in .m4v, .mp4, and .mov file formats. Motion JPEG (M-JPEG) up to 35 Mbps, 1280 by 720 pixels, 30 frames per second, audio in ulaw, PCM stereo audio in .avi file format. HE-AAC (V1), AAC (16 to 320 Kbps), protected AAC (from iTunes Store), MP3 (16 to 320 Kbps), MP3 VBR, Audible (formats 2, 3, and 4), Apple Lossless, AIFF, and WAV; Dolby Digital 5.1 surround sound pass-through. There are not many options to watch or listen to live TV or radio on an Apple TV, it is not possible to install apps, so you are limited to those provided by Apple. Fortunately. many apps can be viewed from other iOS devices such as the iPad, iPhone and iPod, these devices can be viewed using AirPlay. 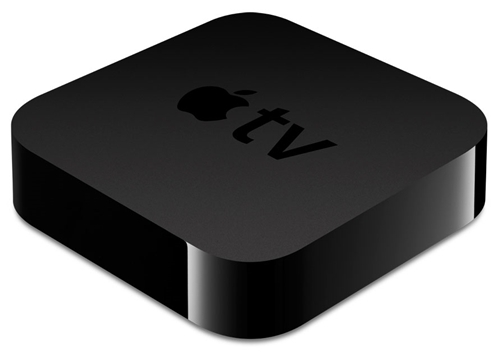 NOW TV is available directly from the Apple TV menu, a valid subscription will give access to Live TV, VOD and films. Live TV channels include Sky 1, Sky Living, Sky Atlantic, GOLD, Comedy Central, FOX, MTV, Sky Arts, Discovery Channel, Nickelodeon, Disney Channel and Nick Jr.
Sky News is also available on the Apple TV with news, weather and a live stream of the channel. The live stream is of excellent quality. 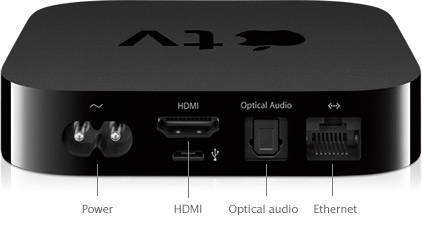 AirPlay is Apple’s audio and video streaming technology. AirPlay audio and video can be sent from any modern iOS device, including iPhone, iPod touch, and iPad, and as well as OS X. Using AirPlay will allow users to stream any apps stored on iOS devices to an Apple TV, such as BBC iPlayer, ITV Player, 4oD, Demand 5, FilmOn and many more. Media controllers on iOS and in iTunes on the desktop allow only specific video or audio to be sent via AirPlay, while AirPlay mirroring on iOS and OS X allow the entire screen to be sent. Thanks to AirPlay mirroring, anything be sent to Apple TV and displayed on a TV. 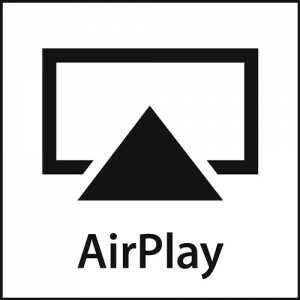 The video receiver portion of AirPlay currently only works with Apple TV as an end-point, though the audio receiver portion has been licensed out to a number of speakers and home entertainment gear manufacturers, and is supported by Apple’s own Airport Express base station. Apple has made some improvements to AirPlay in iOS 8 by enabling compatible devices to make direct connections with each other for content streaming. This eliminates AirPlay’s reliance on a Wi-Fi network. In previous versions of iOS — including the latest iOS 7.1.1 release — all of your devices had to be connected to the same Wi-Fi network to partake in AirPlay streaming. In iOS 8, AirPlay catches up with rival streaming technologies such as DLNA by allowing direct device connections. So your Mac, iPhone, Apple TV, and other AirPlay devices can talk to each other without using Wi-Fi.